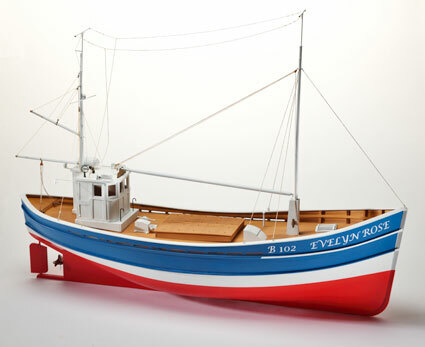 Billings Boats BIL524 Evelyn-Rose English Fishing Cutter 1/20 scale wood ship kit! A typical English cod fishing trawler from the 1950’s to the 1970’s sailing along the east coast of England from Ipswich to North Sunderland and Northumberland just below the Scottish border. The boats where equipped with a 150 HK Diesel Engine. The boats where hauled up on shore via a line fastened to the bow. The crew on these vessels where between 3-5 men.